We took inspiration for this month’s styled spaces from a wonderful book called Extraordinary Spaces by Rockett St George. Creators of show stopping interiors, the book is full of dreamy homes, mixing luxe and rustic, and using neutral and dark colours with a hint of Scandi styling. 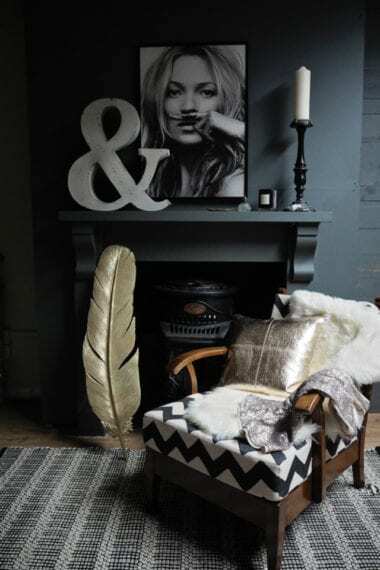 I styled up the fireplace using this amazing print from Desenio, of the iconic Kate Moss. This print could go almost anywhere and look absolutely amazing, but I have decided to use it here in an almost boudoir setting. I kept it monochrome but with lots of gold touches, including this amazing gold feather wall art, here just propped up against the fireplace. The ampersand adds an industrial, graphic touch. The vintage mid-century chair is from Stubenhocker in Norwich and upholstered in Tori Murphy fabric. Add a sheepskin for a touch of Scandi cosiness, and a metallic cushion really makes the textures pop. 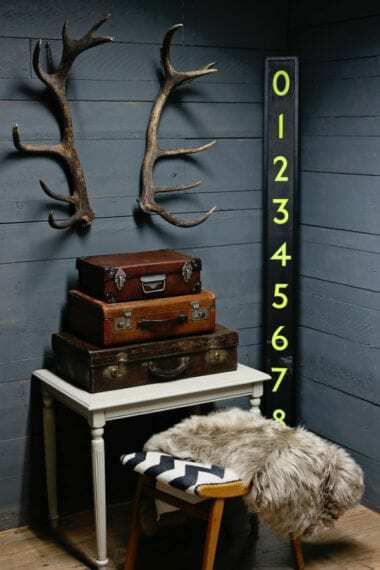 Antlers are very much a signature of Rockett St George signature style, and I decided to hang these above some beautiful vintage leather suitcases, stack various sizes for maximum effect. The gorgeous vintage bus sign was again from Stubenhocker in Norwich. We layered up this gorgeous vintage day bed with monochrome cushions made from beautiful fabrics from Tori Murphy and Abraham Moon. These wool weaves are perfect for both contemporary and traditional interiors. 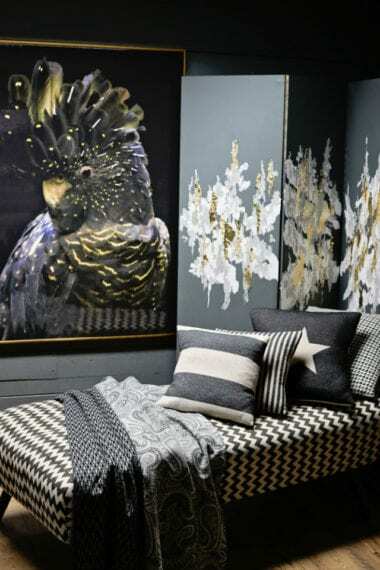 The striking screen was made using Farrow and Ball paints and gold leaf sheets – the stunning bird picture brings this whole area together beautifully, for a truly bold individual look.